Inspiring Art Teachers to Explore Art History | Curator’s Corner: Art History Déja Vu? Do you ever stop and wonder if there really isn’t anything new in subject matter or style in art? Sometimes I stop and look at what I’m painting and think: “Why bother, landscape’s been done before.” Then I realize that my own personal contribution to the genre is what is new, because no two artists have probably ever thought EXACTLY the same about either their style or subject matter throughout the history of art. That being said, it is still very interesting to look at similarities in style and subject matter, and although there is no written evidence to support a theory, conjecture on “Oh, sure, the other artist MUST have seen that.” Such is the case with the subject of the ancient Egyptian goddess Isis and one theory about how it influenced depictions of the Madonna and Child in Christian art. 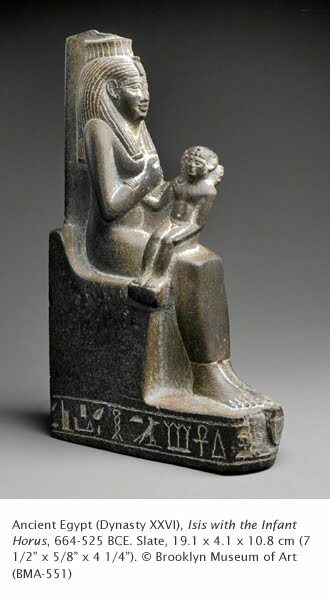 Some scholars point to the numerous depictions of the ancient Egyptian Goddess Isis (wife of Osiris, lord of the underworld) with her infant son Horus as models for early depictions of Mary with baby Jesus. Why is this pointed to as an early model for artists making art for Christians? The cult of the goddess Isis, which ballooned in popularity during the first century CE, rivaled Christianity for devotion during the early days of the Christian church. One might say that Romans rapidly lost faith in the Greek/Roman pantheon of gods during the civil wars, barbarian attacks, and general mayhem of the empire. Isis was the goddess of mothers, childbirth, and the home, among other things. This nurturing pedigree would appeal to soul-sick Romans just as the Madonna and Child did to Christians who were constantly brow-beaten about sin and repentance during the Middle Ages. Most of the artists who created works for early Christians were not themselves Christian, and I think it is completely possible that they used the very popular image of Isis/Horus as a model for another mother and child theme. I’m not even going to go into the background story of Isis, with its drama of betrayal, death, and resurrection. Another possible source for laying the groundwork of a popular Christian subject was Greek and Roman depictions of Venus and Cupid. Although they are another mother and son pairing, it’s a stretch when you compare garments, or lack thereof. The thing I find charming about this little sculpture is, despite the fact that t his is quite late in the evolution of Egyptian art, the figures are depicted in the same, hieratic, stiff, immobile pose as that seen on figures from two millennia earlier. Their bodies are perpendicular to each other and are solidly attached to the throne. Isis is often depicted with a throne on her head, and her name means literally “seat.” Perhaps that is why her posture so closely mimics the geometric throne. She also sometimes wears the cow’s horns and solar disk of Hathor, as she does in this version. Her hand is most often shown to her bosom to indicate mothering/nurturing. Christianity seems much more rooted in Eastern Mediterranean religious faiths than is often portrayed. I like the whole idea of repeated cycles of birth, death and rebirth that seem to have been common across the region. A Good thought provoking article. Thanks!